Maxwell, the last male pup from Sadie’s litter is a Phase 1 Accelerated puppy so I thought I’d show you the indoor set-up that we use. I really like the taller Iris pen that comes with 8 panels. Cavachons are capable of escaping over a shorter pen, so we always recommend one that is closer to 3ft tall. The Iris pen can be made long and skinny as is shown below, or it can be a nice 4ft x 4ft square. When the pup first comes home and during the training process, it is important to organize his pen and set him up for success. Here, Maxwell has limited space, encouraging sleeping in the right spot, chewing his bully stick in the right spot, and most importantly, going potty in the right spot. He naturally doesn’t want to soil his bed/hang out areas, so there is very little “other” space, making the litter box a natural choice. We also take him out as frequently as we can, but if we are not home, he has everything he needs in this space. I recommend, when the puppy first comes home, to make his pen skinny like this. As he is more dependable, you can opt for a more square and spacious area. At night, you can also remove some panels, so there are only 6, eliminating almost all floor space and having only bed or potty for his choices. Maxwell is pretty content in this puppy safe zone. It is right in our kitchen, so he is in the middle of everything that is going on in the household!! 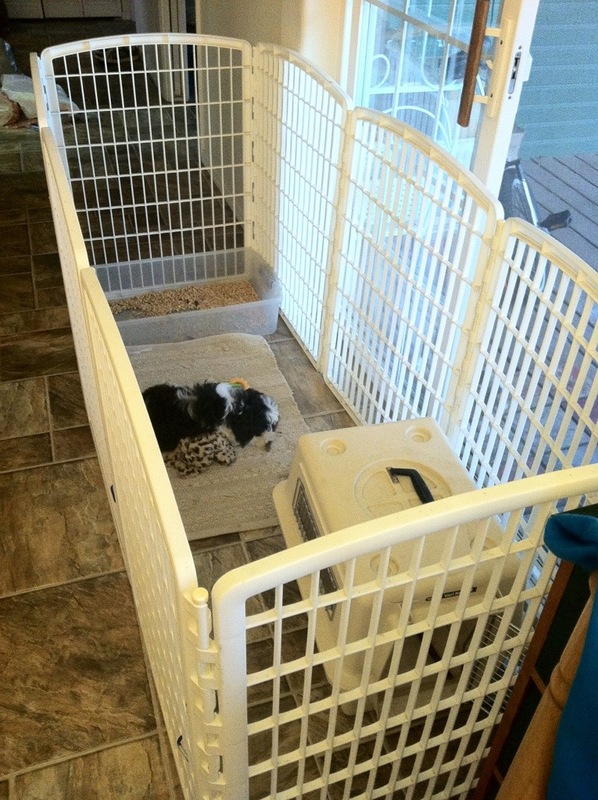 PS, his crate is backwards only because the door was swinging out the wrong way and I didn’t take time to change it. I like to attach the door to the side of the Iris Pen, so that it stays open. 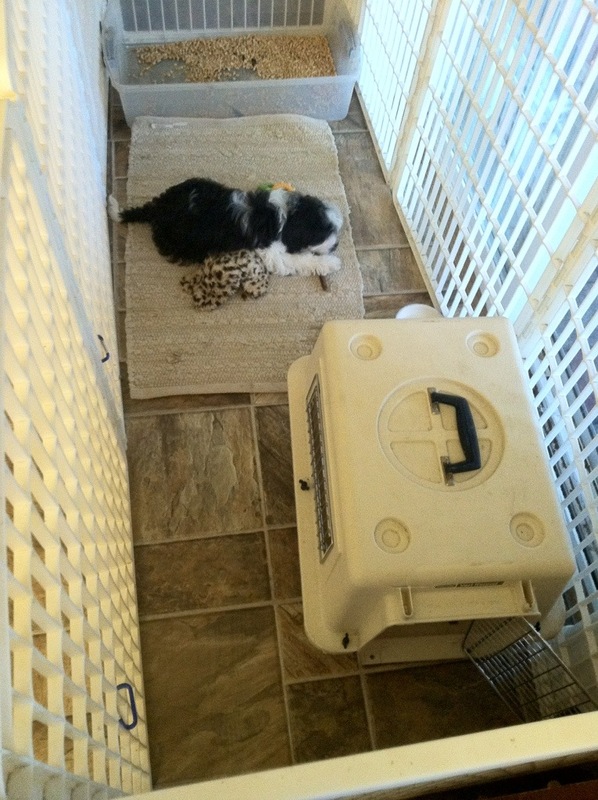 This entry was posted in Accelerated Puppy, Black & White, Cavachon, Daily Dog Stuff, Litter Box, Sadie, Training. Bookmark the permalink.